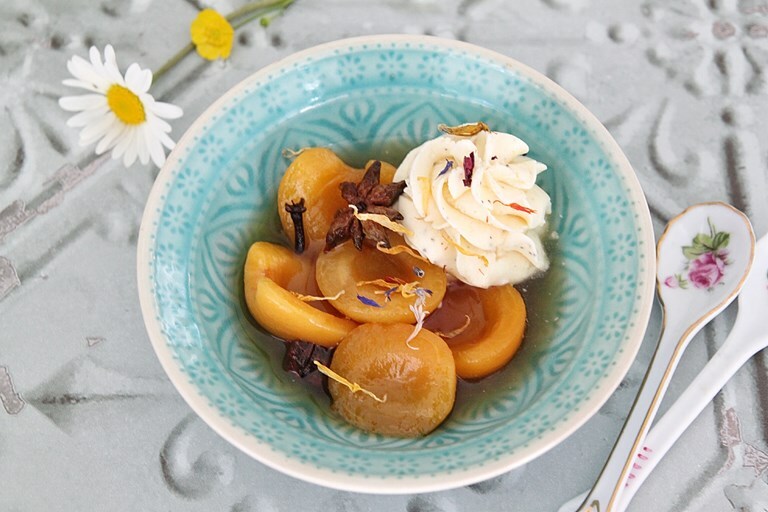 Nisha Thomas discovers how well mirin works in desserts with this beautiful spice apricots recipe. The rice wine adds delicate sweetness to the apricots which are poached with star anise, cinnamon and cloves for an aromatic finish. Served with a cardamom whipped cream, this makes an easy yet indulgent dessert. This is the first time I've tasted mirin and I'm pleasantly surprised by how much I like it. I think I never really got around to experimenting with it before because I really didn't know where to go looking for it. Now that I have it figured out, I've made a note to self to discover new ways of cooking with mirin. I'm quite thrilled at how mirin has worked so well in this dessert as I would never have thought of rice wine as a dessert ingredient. It's been very well received around here and the husband has already requested more such innovative recipes. All sorts of fruits like peaches, pears, nectarines etc. should work in this recipe. Make sure you go for firm fruits so they don't disintegrate while poaching in the syrup. The mirin does add a delicate sweet flavour so I've gone easy on the sugar, although feel free to adjust according to taste. You can also serve them with Chantilly cream, custard or even ice cream. It tastes fab even on its own.